Writing in Rolling Stone, critic Paul Nelson recently called Zevon one of the three best rock artists to appear in the 70s. I wouldn’t go that far, but I do like this album a lot. 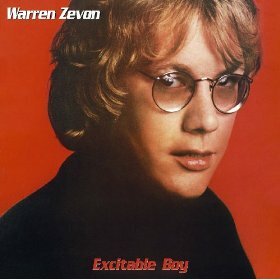 Dominated by Zevon’s slightly crazed, extremely intense personality, its songs manage to be simultaneously funny, absurd, and affecting. Witness the dynamic title cut as well as the current single, “Werewolves of London” (an out-of-left-field hit if ever there was one). For the superb rhythm instrumentation, credit the Section, Fleetwood Mac, and Linda Ronstadt’s band. For the sparkling production, thank Zevon admirer Jackson Browne. Wow, I love this album! Very insightful review and criticism, Jeff. Keep up the good work.